By Charles "Chuck" Trimble The possibility of putting the image of a noted American woman on U.S. paper currency brought forth some noteworthy Native Americans for consideration, especially if the prospective currency was the twenty dollar bill, which carries a flattering image of Andrew Jackson, the seventh President of the United States. Those who pushed for Jackson’s replacement gave good reasons: i.e. his opposition to a national banking system and paper currency, and his role in the Indian Removal legislation and the forced removal of the Cherokee, Creek, Chickasaw, Choctaw and Seminole tribes over the Trail of Tears to Indian Territory (now Oklahoma). Many Indians quickly picked up on the irony and great poetic justice that would be done if a woman from one of those Trail of Tears nations would be picked to replace Jackson, and a movement was started to get the late Wilma Mankiller, the first woman elected principal chief of the Cherokee Nation of Oklahoma, nominated for the honor. However, it turns out that the Treasury Department intends to replace the portrait of James Madison on the ten dollar bill, not Jackson on the twenty. That, of course, took away much of the impetus to get Chief Man Killer selected for the honor. Without the irony or the poetic justice, it would be difficult – in Indian Country and in the general public – to justify her selection over many Native women who have contributed far more substantially to the cause of Indian rights and welfare. In my eighty years, especially the forty-plus years of my involvement in Indian affairs, I have gotten to know many great Indian leaders who were women. In fact, in my judgment four of the top ten national Indian leaders I have known are women: Helen Peterson, Oglala/Cheyenne; Ada Deer, Menominee; Lucy Covington, Colville; and Ruth Muskrat Bronson, Cherokee. I am speaking, of course, of leadership in modern times. Prior to World War Two, there were few Indian women, aside from Pocahontas and Sacajawea, who were renowned in the general public. The LaFlesche sisters, Susette and Susan, of the Omaha were accomplished and did much for their people, and the Tall Chief sisters of the Osage, Maria and Marjorie, both world-renowned prima ballerinas, probably would not be considered political leaders or activists of the kind that the people selecting the honoree are seeking, given the early suggestion of Rosa Parks, Harriet Tubman and Eleanor Roosevelt. In 1899 a five dollar bill with the head of a war-bonneted chief was issued and coins of various denominations have carried the image of a Native American, including the silver dollar which has the image of Sacagawea. Aside from heralded chiefs in the warfare waged by the various tribes in defense of their lands and way of life, there were few Indian leaders who attained national or international notoriety. In the area of intertribal statesmanship or political activism, such names as Tecumseh, Sequoyah and Wovoka must also be considered. But until the National Congress of American Indians was formed in 1944, there was no arena for such inter-nation leadership to manifest itself. Such was the situation for women as well, in fact, more so. The belated honor – in 1978 – of a woman, Veronica Homer, being elected to the NCAI presidency may be attributed to the fact that most of those who were elected President were political heads of nations; and women, often for reasons of tradition or culture, had yet to win their place in those offices. However, in the internal operation of national, supra-tribal political organizations such as NCAI, women assumed leadership early on. 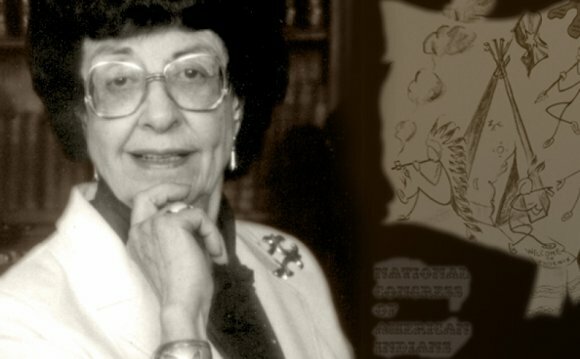 In fact, the very first NCAI Executive Secretary was Ruth Muskrat Bronson, Cherokee. From her apartment kitchen in Georgetown, we are told, she nurtured the organization through its infancy in very difficult times. And another woman, Helen Peterson, Oglala Lakota, led the organization through the dark years of Termination and alongside President Joe Garry of Coeur d’Alene, put a stop to Termination as national policy. And it was Lucy Covington who rallied the citizens of the Colville Tribe of Washington to elect her slate of candidates and to oust the pro-Termination tribal council and – in the eleventh hour – to stop the process of the tribe being terminated and their massive land and water resources being liquidated.